Women Religious have been the vanguard of anti-human trafficking efforts for decades. 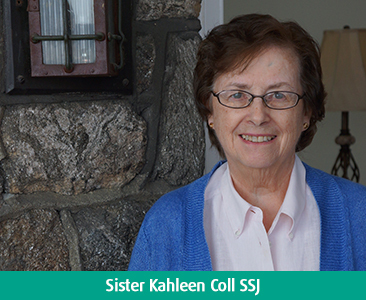 Sister Kathleen Coll SSJ is a leader in the Catholic Church’s anti-trafficking movement. She is a Steering Committee Member with the U.S. Catholic Sisters Against Human Trafficking (USCSAHT). In 2015, Sister Kathleen represented the United States as she joined 40 leaders in the Church’s international network for the Talitha Kum Second International Coordination meeting in Rome. The member organizations of Talitha Kum are primarily engaged in the prevention and protection for victims, in cooperation with several governmental, non-governmental and church organizations. Click here to read more about Sister Kathleen.